- I don't know if something like has ever been done before, but maybe I'm just not looking hard enough. - I'm no pro at front end design / implementation. - The personality profiles might not be accurate. For all I know, I might be a terrible judgement of character. But hey that's what forums are for, eh? - Constructive criticism is always welcome. Overview: Since League of Legends is allowed to have a personality quiz for the Star Guardians troupe, I figured Touhou deserves one as well. 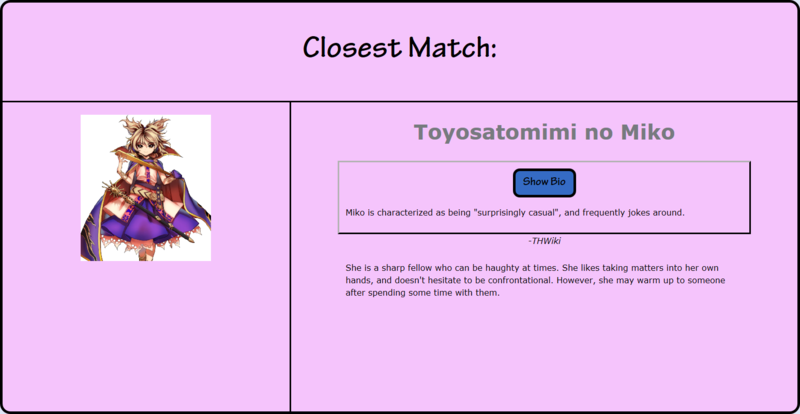 Quiz will generate a set of personality metric values corresponding to the taker and then compares them with each of the Touhou characters on record. After 13 questions, the quiz returns the two closest characters to the taker personality-wise. 2. 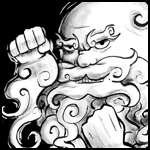 Character is either a playable (story mode only), stage 6 boss, or EX in at least 2 official games. Final compiled list has 29 characters (listed below). Metrics: In each character profile, there are numerical values for each of 5 personality metrics to compare against the taker’s, kind of like the metrics you see in Myers-Briggs or OCEAN tests. After the taker answers a question, one or more of their metric values are updated to a new average value. Is the person open to new ideas? Are they curious about other people in general? How confident is the person about their tastes and values? Are they affected by peer pressure? Is the person likely break down if someone gets verbal with them? Self-explanatory, but can also indicate how quickly the person takes in new information, rather than just how much they already know. Is the person confrontational or nosy, or are they more on the passive side? Do they usually take matters into their own hands? Is the person pleasant to have around as company? Do they respect other people’s autonomy in a social setting? Would others describe the person as uptight? Each character is assigned a set of 5 values, each ranging from 1 to 4, in the above order. For example, a character with the values 1 4 2 1 3 is more Specialized than Open, more Flexible than Headstrong, and so on. 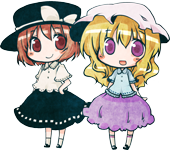 In case you're wondering, my Touhou girl is Mamizou, then Marisa as runner-up! Geez man... I'm actually speechless after reading what you added as bio and thought about myself. Futo, with Ichirin as a runner-up. OK I can abide this. I can be pretty condescending. Miko was one of the harder ones to profile for me, ngl. The former is a little funny since a friend just told me the other day that I have this "does not compute" face, and one of the things I really like about Sanae is her blank '... now loading ...' face she did back in TD and UFO. What a weird coincidence. Don't know how I got Aya. But you seem to be a humble servant of... <someone>. 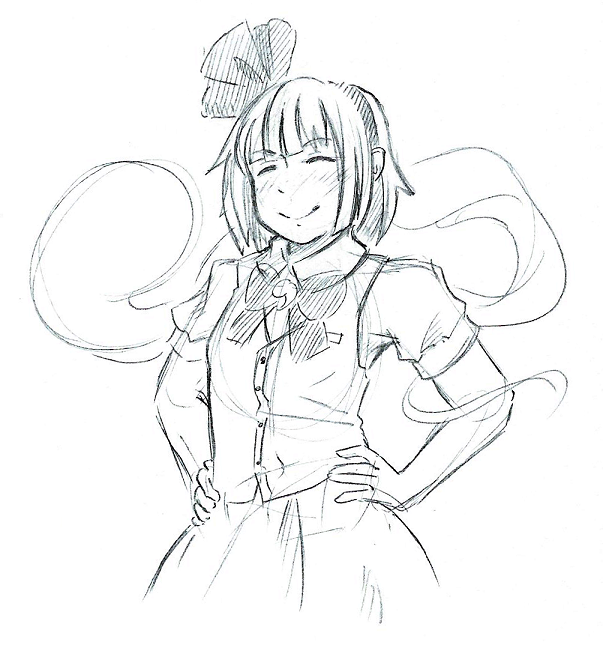 Reisen, with Meiling as runner-up. I can live with that. "Do you feel that there is often something to contribute to the people around you?" -- what does this question mean? Sakuya, with runner-up being... Byakuren? Though I doubt I'm as elegant and well-mannered as they are with how sloppy and crass I am IRL, I guess it kinda makes sense when I think about it. Nowadays I tend to be more cold and dismissive towards whatever annoys and/or frustrates me than outright angry, and while I can be open-minded, if someone tries to forcefully shove their ideas and opinions to me they'll just end up pushing me away even further. I got Reimu and Suika as runner-up. It kind of makes sense, actually. Got Suwako, with Yuyuko as a runner-up. It's kinda a half-half situation for each character here. I'm not as mischievous as Suwako is described to be, but do always accept defeat after fair confrontations even though it's not the most comfortable of situations, and I'm not as playful as Yuyuko is portrayed to be, but do have a decent sense for humor and generally don't easily get offended by jokes. Reisen and runner-up Mokou. Yep, I'm a loner. Reisen and runner-up Marisa, guess i'm pretty normal huh ^^'. There's a bit of a loading time when you click Get Started. Probably all the images. I wasn't aiming for efficiency when I coded this thing, lol. Hmm, from reading the replies it looks like the results seem to be an OK fit for the majority. Heheh, fantastic. Everything is going as planned. But still, I hope a Patchouli shows up sooner or later. She's one of my favs. No, it just plain doesn't react to clicking the button. No errors or anything. Kokoro and Reisen as my runner-up. Based on those descriptions I guess both balance well together to describe me although I tend to be someone who embraces emotions. I like to smile, laugh and all that neat stuff. Sorry to hear that :/ I might have to port this thing onto another hosting service. Give me a few days, I'll be on the road for a while. 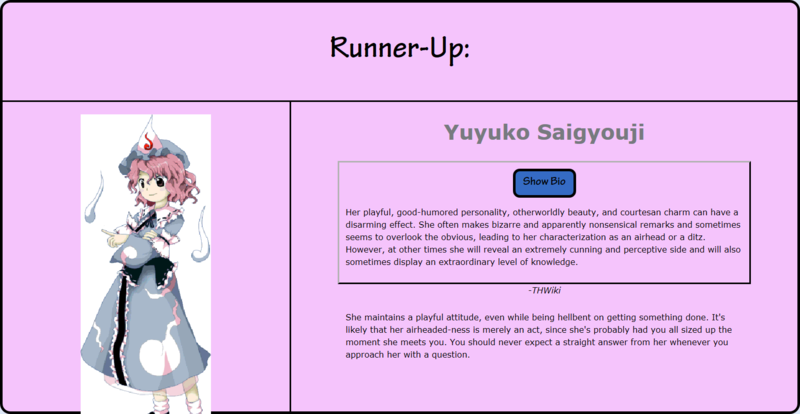 Got Aya with Yuyuko as my runner up. Nevermind, it works at my home. Closest match Marisa, runner up Yukari. I usually play around and take it easy until I can't afford to do so, so I guess these are results I can get behind of. I'm nowhere proactive nor outgoing as Marisa is though, but apparently science seems to hold a different opinion so okay I guess. Sorry for not being clearer. I meant that I couldn't parse the grammar of the question. As it stands, it sounds like you are asking "Do you feel there is often something you should be contributing, but are not?" whereas I think you meant to say "Do you feel that there is often something you contribute to the people around you? ", giving a quite different sense. I'm good with this. I look up to Byakuren as a hero in a way. I have a lot of respect for her so it makes sense that I've become more like her as time passes. Sakuya? Really? I took it as a bit of an insult but it makes sense. I often took these quizes when Reimu was my least favourite character and often got her. I often find with Touhou that I'm most like the things I dislike.